Virtue, Big as Sin is impressively wide-ranging in theme and style. It illuminates everyday vignettes with solicitous spotlights such as the bereaved son sorting the contents of his father’s medicine cabinet, or the father whose son’s driver’s education recalls the time his own “unharnessed” Mustang went “bungeeing” around a bend; it celebrates the artist’s creative highs, or reflects on the misfortunate who is forever nearing the threshold of achievement, aware that life may prove a “most inept librettist” and should thus be paired with our “strongest song.” Osen’s dexterity with both formal and free verse is apparent. His wit and humor prevent the serious from becoming ponderous while his intelligent insight lends depth to the lighthearted. Reading and rereading this outstanding debut collection, it is easy to see why—from the first poem to the last—it is a worthy winner of the 2012 Able Muse Book Award. In his talent for tragedy and comedy, and for mixing them, Osen takes his place in a distinguished line of English-language poets that runs from Chaucer and Shakespeare down to our day. 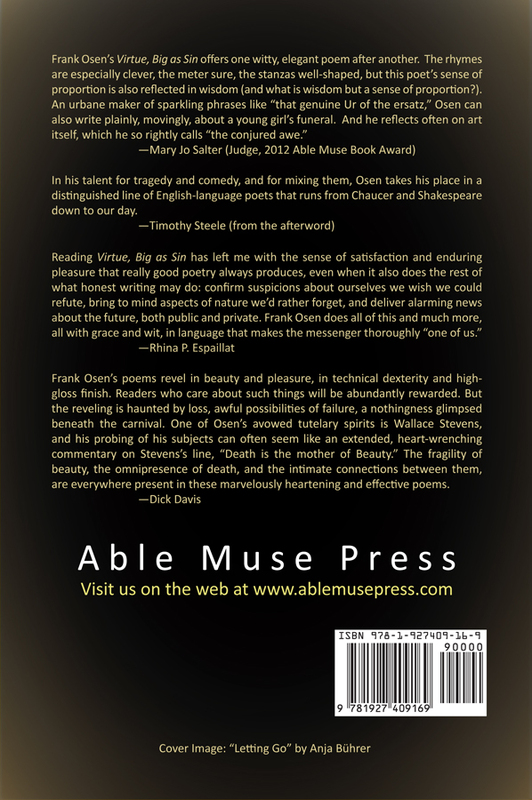 Frank Osen’s poems revel in beauty and pleasure, in technical dexterity and high-gloss finish. Readers who care about such things will be abundantly rewarded. But the reveling is haunted by loss, awful possibilities of failure, a nothingness glimpsed beneath the carnival. One of Osen’s avowed tutelary spirits is Wallace Stevens, and his probing of his subjects can often seem like an extended, heart-wrenching commentary on Stevens’s line, “Death is the mother of Beauty.” The fragility of beauty, the omnipresence of death, and the intimate connections between them, are everywhere present in these marvelously heartening and effective poems. Frank Osen was born in Yokosuka, Japan, in 1954, grew up in Southern California, and is a graduate of the University of California at Berkeley and Loyola Law School in Los Angeles. He worked for many years in law, as general counsel to health care companies and also in real estate investment. He lives in Pasadena, California, and walks to work at the Huntington Library. He and his wife, Susan, have been married for thirty years and have three grown children. 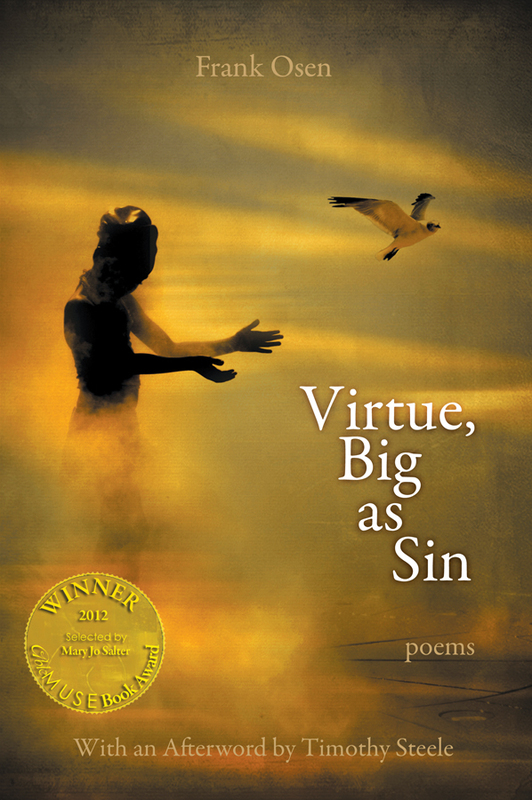 Virtue, Big as Sin is his first full-length collection and the winner of the 2012 Able Muse Book Award.